Dumbarton Oaks will again offer an intensive four-week course in medieval Greek and paleography in the early summer of 2008. A limited number of places will be available for students from North America and Europe. The principal course will be a daily 1 ½ hour session devoted to the translation of sample Byzantine texts. Each week texts will be selected from a different genre, e.g., historiography, hagiography, poetry, and epistolography. Two afternoons a week hour-long sessions on paleography will be held. One additional hour weekly will provide instruction in the basic bibliography of Byzantine philology (dictionaries, grammars, etc.) and electronic tools, such as the Thesaurus Linguae Graecae. In addition each student will receive a minimum of one hour per week of individual tutorial. Thus 11 ½ hours per week will be devoted to formal classroom instruction. It is anticipated that students will require the remaining hours of the week to prepare their assignments. If they should have extra time, they may conduct personal research in the Dumbarton Oaks library. No tuition fees will be charged. Successful candidates from outside the Washington area will be provided with housing in the guesthouse at no cost and lunch on weekdays. Local area students will not be offered accommodation, but will receive free lunch on weekdays. Students are expected to cover their own transportation expenses. Applicants must be graduate students in a field of Byzantine studies (or advanced undergraduates with a strong background in Greek) at a North American or European university. Two years of college level ancient Greek (or the equivalent) are a prerequisite; a diagnostic test will be administered to finalist applicants before the final selection of successful candidates is made. Applicants should send a letter by January 15, 2008, to Dr. Talbot, describing their academic background, career goals, previous study of Greek, and reasons for wishing to attend the summer school. The application should also include a curriculum vitae and a transcript of the graduate school or undergraduate record. Two letters of recommendation should be sent separately, one from the student’s advisor, and one from an instructor in Greek, assessing the candidate’s present level of competence in ancient or medieval Greek. Principles of selection will include three considerations: previous meritorious achievement, need for intensive study of Byzantine Greek, and future direction of research. Awards will be announced in late February 2008, and must be accepted by March 15. 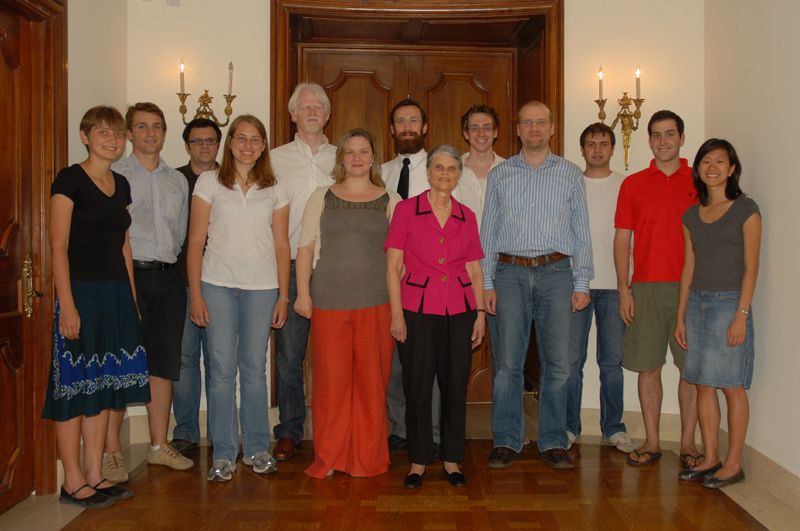 Paul Robertson, Katherine Lu, Maya Maskarinec, Adam Goldwyn, Milena Grabacic, Hasan Çolak, Florin Leonte, Matthew Dal Santo, Ian Gerdon, Ann Marie Patzwahl.